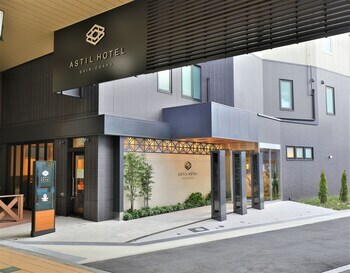 With a stay at Astil Hotel Shin-Osaka in Osaka (Yodogawa), you'll be within a 15-minute drive of Umeda Sky Building and Open Air Museum of Old Farmhouses. Featured amenities include complimentary wired Internet access, dry cleaning/laundry services, and a 24-hour front desk. With a stay at this vacation home in Kyoto, you'll be within a 15-minute walk of Toji Temple and Kyoto Tower. Located in Hanamaki, Zakuroen Kada no Yunoyado is a 3-minute drive from Dai Onsen and 8 minutes from Hanamaki-onsen Rose & Herb Garden. The front desk is staffed during limited hours. With a stay at JR Hotel Clement Tokushima in Tokushima, you'll be just steps from Bizan Park and German House. Free self parking is available onsite. When you stay at Shotoen in Yonago, you'll be 11 minutes by car from Yumigahama Park. The front desk is staffed during limited hours. Free self parking is available onsite. With a stay at Henjokoin in Koya, you'll be in the mountains, just a 1-minute walk from Karukayado Temple and 9 minutes by foot from Kongobuji Temple. Free self parking is available onsite.